Based on real events and adapted from the book by Richard Hough, ‘The Bounty’ tells the story of an expedition voyage of a British ship HMS Bounty to the island of Tahiti, the Pacific. Led by Captain William Bligh (Anthony Hopkins) and Master’s mate, Fletcher Christian (Mel Gibson), the ship soon crosses the most dangerous waters in search of an island full of bread plants. However, the harsh discipline of the Captain on board and the attractions of the tropical paradise soon become too irresistible for the crew. The eventual mutiny on the ship, headed by Christian, is only the beginning of the adventure in which the levels of maritime skill and endurance become the ultimate factors of survival. 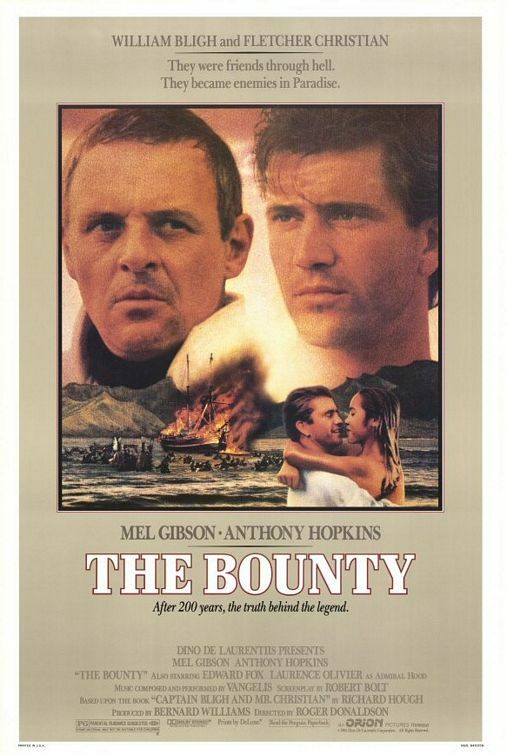 It is impossible not to emphasise the cast here: apart from Anthony Hopkins and Mel Gibson in their respective lead roles, ‘The Bounty’ also stars Daniel Day-Lewis as the Sailing Master, Liam Neeson as the Ship’s Corporal, Philip Davis as the Midshipman and Lawrence Olivier as Admiral Hood. Some say that it was ‘The Bounty’ which helped to rocket to stardom such distinguished actors nowadays as Anthony Hopkins, Liam Neeson and Daniel Day-Lewis, whose role in ‘The Bounty’ was the first most significant one in his career. Anthony Hopkins is particularly incredible in this movie. His character appears powerful and controlled, and we even see in his portrayal of Captain Bligh the despotism and mercilessness he would later project playing Hannibal Lecter in ‘The Silence of the Lambs’ (1991). The rest of the cast is also good, although Mel Gibson received the most criticism for his performance. The critics pointed out that Gibson should have displayed more passion and “agility” in his role of Fletcher Christian, and, acting alongside Hopkins, his performance appears dull at best. This is even more so, since the previous portrayals of Fletcher Christian, for example by Clarke Gable in 1935 and Marlon Brando in 1962, were nothing short of invigorating and inspirational. Going back to the story, it is told through Captain Bligh, as he recounts the sea voyage events to the British Admiralty, currently being present at the hearing. This “discourse” employed by the movie is a clever way to bring more authenticity to the story. The film itself is regarded as the most accurate depiction of the actual mutiny happened, and the film’s “realistic” ending makes this very hard to doubt. The screenplay was also written by no other than Robert Bolt, who previously wrote screenplays for such cinematic masterpieces as ‘Lawrence of Arabia’ (1962) and ‘Doctor Zhivago’ (1965). What is so great about ‘The Bounty’ is that it is not just an adventure movie with a simply story. There are many “layers” to it: there is love blossoming amidst all the chaos of betrayal and mutiny; there is this sense of camaraderie developing among the crew members, which is deeply felt; and there is this display of Christian’s psychological dilemma as he is torn between his sense of duty and his desire for happiness. The film becomes even more interesting and intriguing when the audience realises that Captain Bligh might not be as ruthless, despotic and sadistic as it would initially seem. Sometimes, Captain Bligh’s harsh remarks to his crew members are wholly justified, and, at other times, they appear plainly cruel. However, taking into account the time period and the serious consequences of a mutiny found on an HMS ship, they might not be “over the top”. Despite the instances of arrogance and unfairness, Captain Bligh certainly respects his people when they behave right, and wants to return the ship back home safely. There is the episode in the movie when Captain Bligh gives his share of fish to one of the lower crew members, and shows compassion when one of his men volunteers his body for the benefit of others should others begin to starve. Taking all these circumstances into account, the character of Lieutenant Bligh becomes a real study. Don’t think I’ve ever seen this, going to add it to my list. Good, fascinating review! Although I was never a Gibson and Hopkins fan. The far from home – the more changes in mind according to new circumstances, right? There are another worth movie about marine topic named “Master and Commander: The Far Side of the World” with Russell Crow that can be of some interest for you. Thanks a lot, Artem, and bear in mind that this film stars Liam Neeson as well! To be honest, I was not really impressed with ‘Master and Commander’, though you are absolutely right – it concerns the topic of sea voyage, so should be mentioned. Great review. I’ve just finished this version of the Bounty story and really enjoyed it. Can’t believe how young Daniel Day-Lewis was (and Mel Gibson for that matter)! I great up with a super 8 version of Mutiny on the Bounty with Marlon Brando so that will always hold nostalgic value. I really struggled with Master and Commander though. Personally feel it cannot be compared to the Bounty movies. Have you seen the 1935 Mutiny on the Bounty and if so, any good? Thank you! It is funny to watch all these actors so “rejuvenated”, isn’t it? 🙂 I have to admit that I haven’t seen the 1935 version, but the reviews on it were extremely positive and it did win an Academy Award in the Best Picture category.So, if you like the story, it is worth watching.